On Thursday, March 28th, a proclamation was presented to the YCH Medical Staff in honor of National Doctor’s Day, which officially took place on March 30th. 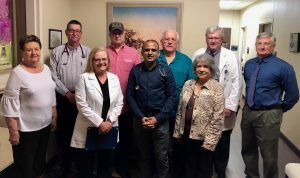 During an honorary breakfast hosted by New Horizons, Yoakum Mayor, Annie Rodriguez and Board Chair, Elorine Sitka, presented a proclamation to the physicians on behalf of the City of Yoakum, for the service and compassion they provide to the people of our community. Pictured left to right: (Front row) Elorine Sitka, Dr. Saundra Anderson, Dr. Haresh Kumar, and Annie Rodriguez. Pictured left to right: (Back row) Dr. James Drost, Dr. John Barber, Dr. Crayton Ciborowski, Dr. Gary Reynolds and Dr. Ralph Wagner.